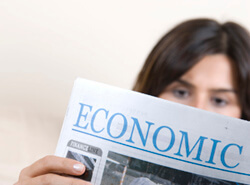 EI professionals specialize in industrial organization, labor economics and finance. Industrial organization includes the theory and tools most appropriate for analyzing issues such as competition policy, economic regulation, and economic damages. Labor economics includes the theory and tools most appropriate for analyzing how labor markets function. Finance includes the theory and tools most appropriate for analyzing how capital markets function. EI economists apply their training and expertise to solve problems in many fields including antitrust, damages analysis, class certification, intellectual property, regulation, competition policy and legal reform, human resource management, transfer pricing and management consulting. 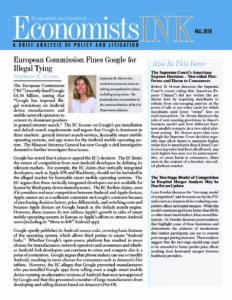 This issue discusses the European Commission’s (“EC”) recent ruling against Google, the Supreme Court’s American Express (“Amex”) decision, and the two-stage model of competition in hospital merger analysis. Dr. Mirrow discusses some key findings in the EC’s decision and points of contention between Google and the EC. Dr. Stoner discusses the Supreme Court’s recent ruling that Amex did not violate the antitrust laws. Dr. Stoner discusses the role of anti-steering provisions in Amex’s business model and how different business models compete in a two-sided platform setting. Dr. Fowdur discusses the “two-stage model of competition” and its recent use by the FTC and courts as a framework for evaluating competitive effects in hospital mergers. Dr. Fowdur discusses recent analyses that suggest the two-stage model may need to be extended to better predict price effects resulting from horizontal mergers between healthcare providers. © Economists Incorporated 2015 – 2019, all rights reserved.